The first and foremost place for the Scripture to be taught and the faith to be received is in the Christian home. 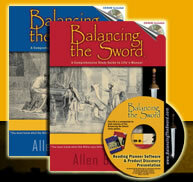 There is no greater forum for the use of Balancing the Sword than as a tool for fathers and mothers to lead in family worship. Adolescents are sliding further into more extreme forms of sin than any previous generation in U.S. history. If our eyes remain closed to the long-term impact of individual families crumbling all around us, forty years from now Christianity in this country will look radically different than what we see today. Let us consider Europe. Let us respond with wisdom and righteousness by diligently teaching our own children the Christian message and life. Remember that a study time with the family does not have to be perfect to receive an A+ in God's books. By perusing the BTS books, it is probably obvious that I'm a person given to detail. However, we must remember that God grades the heart of the teacher and the student more than the perfect delivery or attainment of biblical details. Audio: The Foundation of All Learning - Allen B Wolfe set forth the necessity of having God as the foundation of all that can be learned. This presentation was given at the FPEA convention in Kissimmee, Florida on 05/26/2006. "We have been enjoying our Balancing the Sword Volume 1 during breakfast time. I have four children 12, 8, 6, and 4 years old. While I read the older 3 kids follow along in their Bibles and my youngest looks at his picture Bible at around the same story area. After reading the chapter aloud I ask the 1st question to the 4 year-old first and then if he can't remember the answer it gets passed to the next oldest. If he answers correctly then the next question goes to the next oldest. They love helping each other out with clues. It was my intention to only cover one chapter a day but they always ask for more!!!" Writing: "Give me thine heart"
Here is a great suggestion for family legacy from Kerri in Graham, TX. "We really like the books and hope soon to be able to order a set for several of our children (ages 10-16) so they can have their own set." Allen's Response: "I've had other parents write with the same idea of purchasing a set for each child. If your plan comes to fruition, I would suggest that your children consider writing the date beside each chapter upon the day of completing that chapter. Each book will take a year or two to finish. The dates will serve as a journal of their efforts, prayers, and insights. In the years to come, your children will have a memorial of their noble achievement." Kerri Shared Her Idea: "I also wanted to share something my father-in-law is doing for each of his grandchildren. Perhaps you can share this with others. Every year he purchases a new Bible and reads it from cover to cover, marking meaningful passages and making notes in the margin. He then gives it to one of his grandchildren (usually at graduation). I know my brother-in-law and husband are planning on taking the same Bibles and reading them completely through before they are given to their children. What a precious gift! To have a Bible your grandfather and father have read through, making notes with you in mind." Here are discussion format suggestions from Mrs. M. on the island of Bermuda (i.e., the northeast corner of the Bermuda Triangle). "Thank you for this wonderful study! Our family has been studying the book of Matthew first and we are really enjoying this format for our evening family devotions. We pray, read the passage, answer the questions together, then we add some information to the margins: 1-promises in the text, 2-commands in the text, 3-good character demonstrated in the text, 4-sins listed in the text and 5-we each choose ONE lesson taught in the text (either from the promises, commands, good character, or sins) to apply to our lives in a deliberate way over the next little while. We conclude with prayer again. The 'Application' segment of the study has been marvelous and has helped with character development and moral education more than anything else we have ever used. Thank you for this book, and for your helpfulness in trying to get it to us in Bermuda." PARENTS: Here are verses which speak of parents teaching their children. When a passage is gender specific, the responsibility is given to fathers. [W]hen your children shall say unto you, What mean ye by this service? That ye shall say, It is the sacrifice of the LORD's passover. . . .
Only take heed to thyself, and keep thy soul diligently, . . . teach them [i.e., the commandments] thy sons, and thy sons' sons; Specially the day . . . in Horeb, when the LORD said unto me, Gather me the people together, and I will make them hear my words, . . . that they may teach their children. (4) when thou risest up. And when thy son asketh . . ., What mean the testimonies, and the statutes, and the judgments, which the LORD our God hath commanded you? Then thou shalt say unto thy son, We were Pharaoh's bondmen in Egypt. . . .
That this may be a sign among you, that when your children ask their fathers in time to come, saying, What mean ye by these stones? Then ye shall answer them, That the waters of Jordan were. . . . Hear, ye children, the instruction of a father, and attend to know understanding. For I give you good doctrine, forsake ye not my law. For I was my father's son, . . . . He taught me also, and said unto me, Let thine heart retain my words: keep my commandments, and live. Hear, O my son, and receive my sayings; and the years of thy life shall be many. I have taught thee in the way of wisdom; I have led thee in right paths. [T]he father to the children shall make known thy truth.